Royal Caribbean International is providing the perfect solution for thrill seekers to experience the “Great American Eclipse”. The world’s most adventurous cruise line will host an out-of-this-world, 7-night Caribbean sailing on Oasis of the Seas, which will cruise to the optimal spot at sea for guests to witness the total solar eclipse on Aug. 21, 2017. 99 years in the making, the “Great American Eclipse” is booking up hotels across the country and this Royal Caribbean is providing thrill seekers the perfect solution to experience this once-in-a-lifetime event. 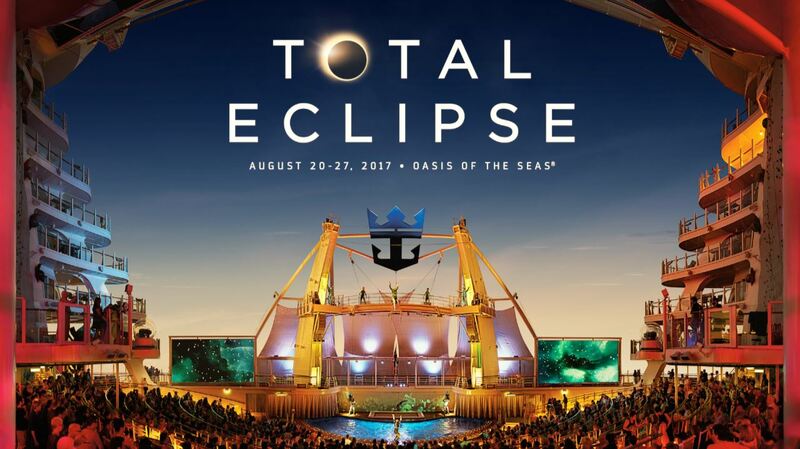 Taking place on one of the world’s largest and most adventure-packed ships, the Total Eclipse Cruise will feature a bucket-list-worthy viewing party with a live concert performed by a major headliner to celebrate the celestial phenomenon that is poised to become the most photographed, most shared and most tweeted event in human history. The optimal viewing area along the eclipse’s path stretches across the USA from Oregon to South Carolina before passing over the Atlantic Ocean. 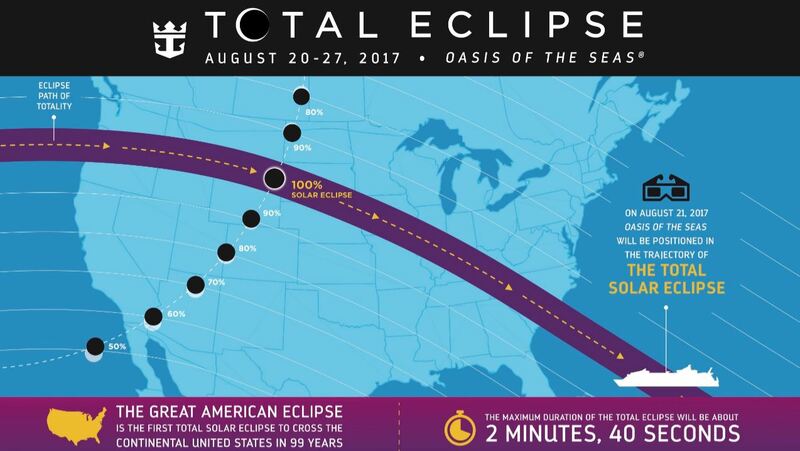 On this trajectory, the sun will be entirely covered by the moon, and a moment this unique deserves an equally impressive experience. During this brag-worthy adventure to idyllic islands in the Caribbean, guests on Oasis of the Seas will be treated to a full slate of eclipse-themed activities, including dance parties, trivia, enrichment lectures, interactive science fun for kids, and tasty cocktails and dishes with names like the Cosmic Cosmo, Planetary Punch and Moon Pie, ensuring the most memorable and adventurous way to commemorate the Great American Eclipse. In addition to celebrating this historic event on board one of the largest cruise ships in the world, thrill seekers also will enjoy Oasis of the Seas’ bold and unexpected lineup of experiences and amenities. From two FlowRider surf simulators and a zip line nine decks high – speeding riders 82 feet across an open-air atrium, to unparalleled entertainment, including Broadway’s hit musical CATS and high-diving, acrobatic performances in the iconic AquaTheater; and world-class dining, featuring a six-course seasonal menu at 150 Central Park by James Beard Award-winning chef Michael Schwartz. The 7-night Total Eclipse Cruise on board Oasis of the Seas will set sail on Aug. 20, 2017 from Orlando (Port Canaveral), Florida and visit eastern Caribbean destinations: Phillipsburg, St. Maarten; Charlotte Amalie, St. Thomas; and Nassau, Bahamas. Together with Oasis of the Seas, seven other Royal Caribbean ships will be sailing to the Caribbean during the total solar eclipse on Aug. 21, on itineraries ranging from 3 to 9 nights, offering guests extraordinary partial views of the phenomenon to make for a memorable experience. The seven ships are Allure of the Seas, Anthem of the Seas, Empress of the Seas, Enchantment of the Seas, Grandeur of the Seas, Harmony of the Seas and Majesty of the Seas.